Many times our advocacy efforts, working to build partnerships and support for our library programs, focus at the local level (and absolutely, support at the local level—from our principals, our parents, our communities, our superintendents, and our local school boards—is critical to what we do!). 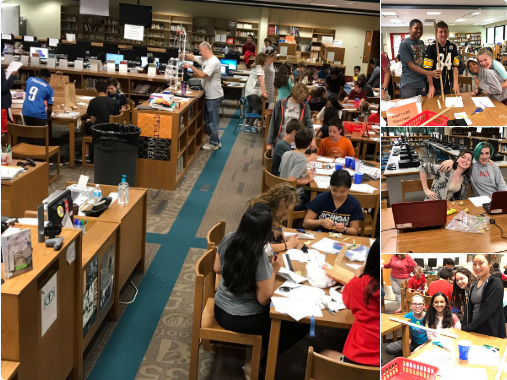 On March 17 in another KQ blog post though, I challenged you to invite federal legislators to your libraries during the spring congressional recess to see firsthand how strong school libraries and librarians impact student learning. Forty-four AASL members in 17 states (AL, CA, CT, GA, IA, IL, IN, KY, MD, MI, NC, NJ, NY, PA, TN, VA, WA) reported inviting their representatives, senators, or both for a visit, and four members have shared that their invitations were accepted. “As part of AASL’s challenge to invite a legislator to your library during their Spring recess, I invited Senator Stabenow and Senator Peters from Michigan to visit my library during the East MS Library Maker Club Showcase, which was scheduled for April 19. Terry Campbell, Debbie Stabenow’s regional manager in Detroit, replied that Debbie’s schedule was booked but that she would love to visit if we could arrange a later date. 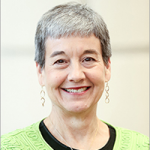 “More than ever, school libraries are important to our students. … In these times of budget cuts and accountability, school libraries must remain open and well-funded! So, when Congressman Raskin confirmed his visit for April 12, I was really excited to show him these things! He got to experience an Hour of Code, see our #weneeddiversebooks March Madness display, and visit with lunch students. 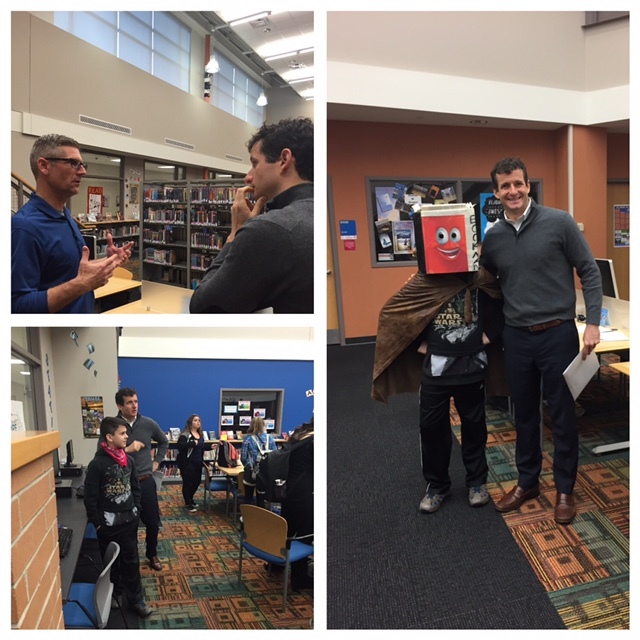 Then, we invited four government classes to come to the media center for a Q and A with the congressman. Prior to serving in Congress, Mr. Raskin was a law professor at American University Washington College of Law and published We the Students, a book about Supreme Court cases that affect students. Interestingly, we have this book in our media center, and Congressman Raskin signed our copy! His knowledge and perspective on student rights was well-received by many students. I’m reminded of what a presenter said in a session that I attended at the recent Vermont School Library Association conference: “People can’t support what they don’t know! Share proactively on a regular basis what you are doing!” Just as our local administrators, parents, and school boards may not know what we are doing unless we tell them, the same holds true for our legislators. 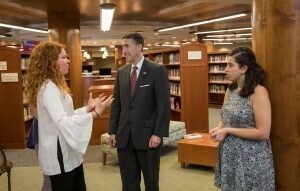 Kudos to each of you who invited a legislator to visit your library! Congratulations to Kathy, Cathy, Stacey, and Kim for successful visits demonstrating how strong school libraries and librarians impact student learning! I invited both my Senators and Representative. My Representative accepted an invitation but we decided to make it later this year when we are in session since he wasn’t available during the past spring and I wanted him to see the library in action. I am looking forward to him seeing students in action. So add New Mexico to the list of invitations extended and accepted, albeit belatedly. Thanks, Suzanne, for your comment! I see this as an initiative that we can (and should!) undertake each year. The better understanding our legislators have of the critical role that school libraries and school librarians play in student learning, the better chance we have of funding to support our work. They need to see what we do. Kyla, wonderful news that you have a Representative visit in the works for the future. Yes, I will need to update my numbers above! Make that 45 members in 18 states, adding NM to the list!